I grew up on the South Wales Coast and spent my formative years in the water, so it’s fair to say I’m not averse to trying out a new watersport (or two). I’ve already ticked quite a few off my bucket list; waterskiing, jet skiing, canoeing, body boarding, surfing, white water rafting… to name but a few. 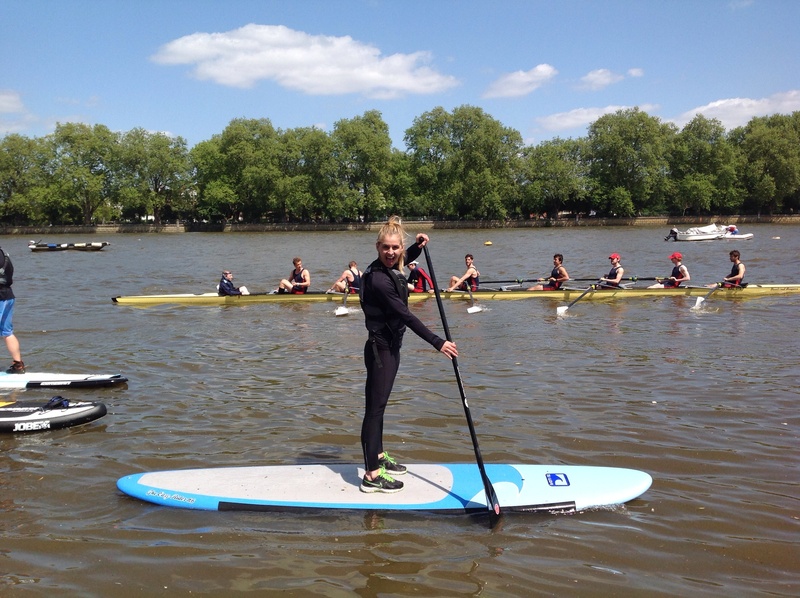 So when I heard that award-winning sports kit company Crewroom had joined forces with Britain’s biggest Stand-Up Paddleboarding school, Active360 and they were launching the Capital’s first inner-London stand-up paddleboarding club, I quite literally jumped at the chance to give it a try! Stand-up paddleboarding (or SUP) is arguably the fastest-growing watersport in the world. Many have told me how much fun it is and with a range of health benefits too, I couldn’t wait to experience it for myself. So last Saturday, I made my way to Putney Embankment in London, ready and eager to set sail (or paddle in this case) down the River Thames. Okay, I’ll be honest; this is not how I pictured my first experience of paddleboarding. I’ve always imagined paddling across a beautiful blue lagoon, somewhere tropical (preferably at sunset). But in this case I could only picture myself wet and bedraggled, wading through cold, muddy water on the Southbank… I couldn’t have been more wrong! The Thames, more specifically Putney Embankment, was a beautiful backdrop for the day! It’s famous for the start of The University Boat race and many rowing clubs have buildings there. It was bustling with activity and provided the sort of scenery that only London can offer. When do we start! We were kitted out with all the necessary equipment and talked through the basic safety features before we set off . To my surprise SUP although similar to surfing in some respects, is actually easier. You stand on the board (or kneel if you prefer) and use a long paddle to propel yourself across the water. The paddle allows you pick up speed, change direction and stop, giving you control of the board at all times. It was great fun and was certainly a whole body workout like no other. But to be honest, I was having so much fun. I hardly realised I was working out at all. 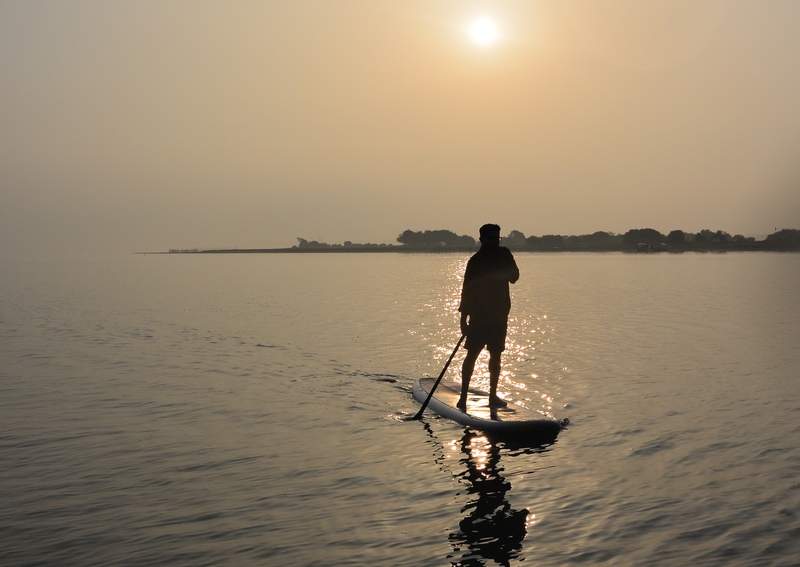 It’s easy to see why paddleboarding is increasingly popular with newcomers of all ages; it’s great fun and there are huge health benefits too. So, If you want to give stand-up paddleboarding a go (and I highly recommend that you do), SUP is currently based in three locations. Putney Embankment (which is a great venue on a Saturday morning in you want to see the boat races in action), Kew and the Paddington Basin. You can sign up to an introduction to paddleboarding, which will cost £45.00 per person, which will include your equipment hire, wetsuit and buoyancy aid. Details on how to book can be found here. So get paddleboarding and let me know what you think! The Summer months have finally arrived and what better way to kick start the season than with the latest instalment from the adidas #workit series. You may remember back in March, I took it upon myself to trial the Spring Series with Barrecore and also got the chance to #workit with the team at Frame in shoreditch. I was impressed at how easy it was to follow the videos at home; whilst getting first class access to some of the most exclusive workouts in London without having to leave my front door! So I’m excited to announce that adidas have launched their #workit Summer Series and have enlisted three of the UK’s hottest female bloggers to take us through our paces. You may already be familiar with the bloggers in question: Em Sheldon from award-winning blog, emtalks; tv presenter, blogger and fitness professional, AJ Odudu and Cat Meffan from Imperfect Matter. These lovely (and extremely fit) ladies have devised six-week workout programmes, each with a different fitness goal in mind. They are easy to follow, available to all of us and best of all they’re free (you heard me). So there’s sure to be something to get you moving this Summer. As the Summer series kicks off with the first video today, I was lucky enough to get the chance to talk to award-winning blogger Em Sheldon about all things fitness, her collaboration with adidas and to find out what inspires her to #workit! Your award winning blog covers beauty, fashion, food, fitness… what inspired your collaboration with adidas as part of their Summer #workit series? adidas is one of the best brands out there when it comes to fitness, I’ve always adored them and always worn their clothing so it made sense. I adore fitness and the opportunity to work with such an inspirational and amazing brand to further my passion and share that with others was a no brainer really! I am all for sharing work out inspiration – nothing feels better than working out and sometimes we just need that little push so I am more than excited to be sharing my #workit with people! You never regret working out! Working out is great for so many reasons, not only do you feel great, but it’s a natural stress buster, it releases endorphins and it’s also a great way to be more sociable (I go to spinning classes with friends and power walk on light evenings with my Mum!) I think it’s important to remember that one bad meal isn’t gonna make a difference, as is one good meal – so it’s great to have a balance, I believe in a healthy balance and lifestyle rather than dieting! How did you design your six-week programme that will feature this month? This was designed with adidas to help me reach my fitness goals; I wanted to be ready for the beach/Summer, I wanted to be toned but more importantly, strong, confident and happy! What tips do you have for people who lack confidence and /or motivation to stay on track with their fitness? Firstly, just get out there and do it, once you’ve started, it will become a routine! If you don’t like the gym, YouTube has so many amazing work out videos and you can do them at home (or you can follow adidas and do my videos!). You don’t need a gym membership nowadays to keep fit! Staying on track can be hard, which is why I always say to stick by the 80/20 rule, be healthy 80% of the time and treat yourself to that treat for the other 20%! That way it stops cravings and binging. I always find it’s easier to stay on track if someone else is doing it with me too, if my whole family are on a health kick, it means the cupboards will be healthier! What is your favourite way to #workit? You cannot beat squatting! Squats target the legs and the core, not forgetting the bum too! I personally adore interval training at the gym as it’s quick and intense but I also don’t think you can beat a hot power yoga session! Em’s six-week, adidas summer series launches this week! To access exclusive adidas #workit content go to Facebook and like the adidas Women page. You can also follow @adidasuk on Twitter and Instagram. To shop the brand new SS15 collection, visit the website or call the adidas Customer Careline on 0845 240 4204 to locate your nearest stockist. 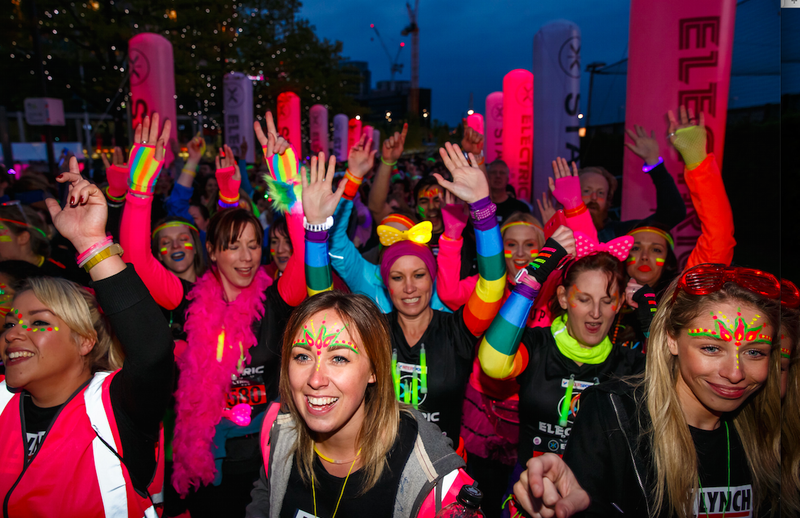 On Saturday I, along with my group of equally enthusiastic friends, ran, danced and quite literally bounced our way around what can only be described as the world’s brightest and most electric 5k! 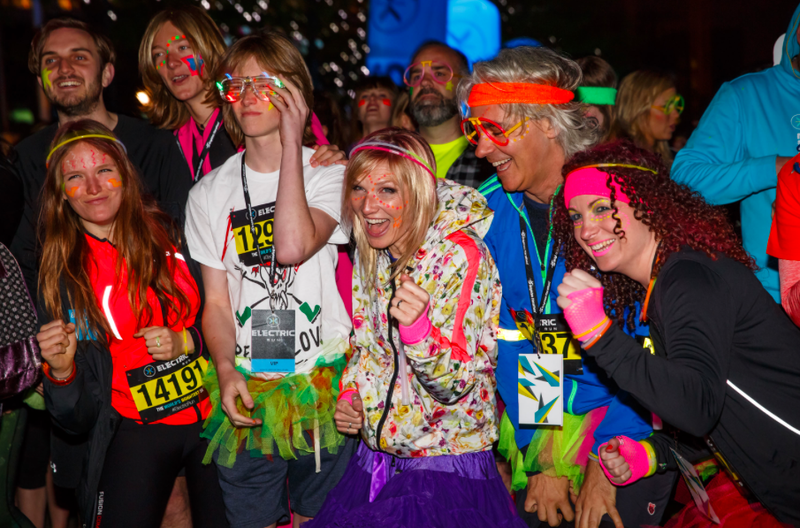 The Electric Run is all about lights, atmosphere and as much neon face paint you can lay your hands on! Open to all ages and happening all around the globe, Its an experience not to be missed! In fact, it’s more about the experience than the run itself! When it came to the outfits, preparation was key! Creativity ruled and the mantra “less is more” did not apply here! There was a mass of flashing LED lights (well you wouldn’t expect anything less from a night time event). If it didn’t blink, shine or shimmer, then we weren’t wearing it! The outfits on display were nothing short of impressive and as the sun started to set the iconic venue, Wembley park, started to glow! After a short wait in the starting chute, we were ready to go! The route took us through immersive “lands of light” and a sea of electric wonderlands. There was plenty of scenery that begged for photo opportunities, (which were taken full advantage of) and moments of darkness which allowed the costumes to come to life! The lights, music and overall electric atmosphere almost made us forget that we were running at all! In fact, we were so distracted by the scenery, that we were nothing short of surprised when we reached the finish line, had we really just ran 5k? The lights and sounds kicked up a notch as we crossed the finish line. Neon trees, glowing arches, lasers, glowing beach balls and other lighting effects celebrated our return along with a well earned coconut water! We then had the option to stay and dance as DJs mixed the latest tunes from the main stage, with the party continuing well into the night! If your looking for a running event that you can train for with friends, raise money for a multitude of good causes and have lots of fun in the process, then I think I may have found you the answer. 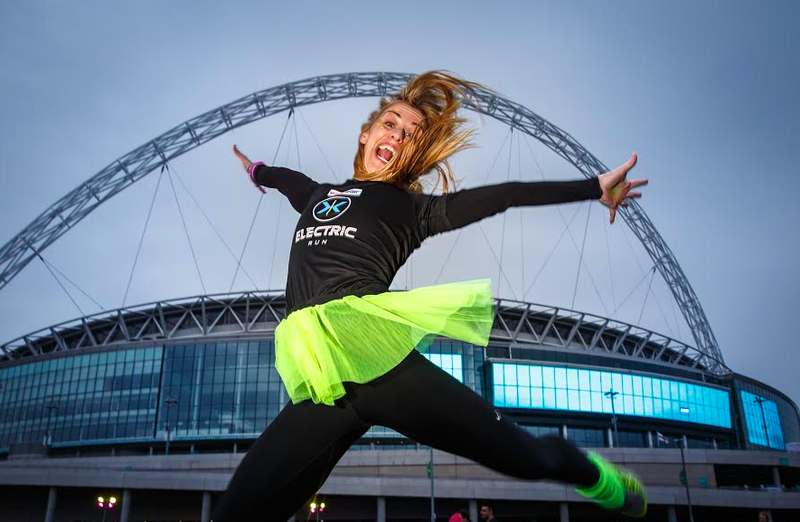 Check out http://electricrun.co.uk/locations-new/ to find a run near you! Wembley Park is one of the most significant regeneration projects taking place in London today. The 85 acre area around Wembley Stadium and The SSE Arena is transforming into a vibrant destination and neighbourhood for London. Millions of people come to Wembley Park every year for entertainment and sporting events, and have been coming for generations. Now, people are living, working and visiting the area to shop, eat, go to the cinema, gym, children’s play area or experience one of the many lively street markets or other events that run throughout the year. Wembley has a new vibe and Londoners and others are loving it. Runners from all over the world are today making their final preparations for this years London Marathon. Their training complete (we hope), they’ll be spending the last few days carbo-loading, hydrating, resting, checking equipment and visualising the 26.2 miles ahead of them! 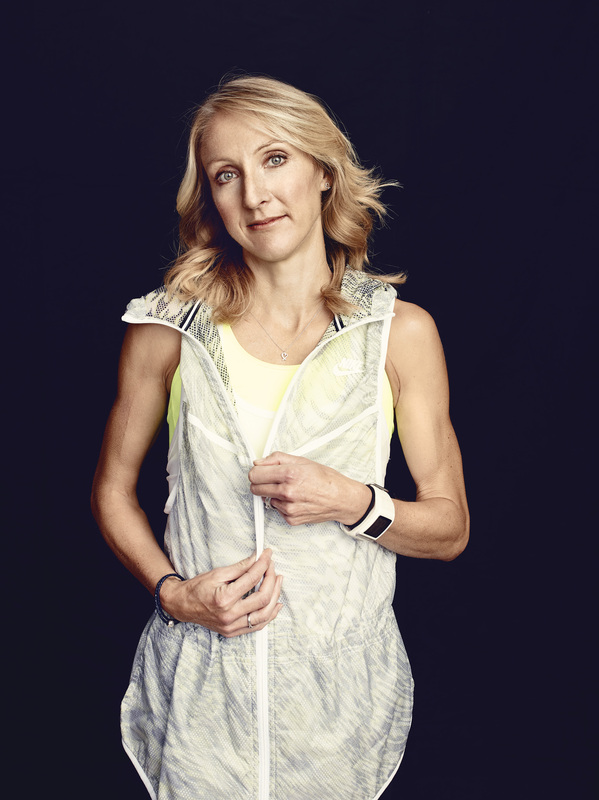 Amongst the thousands of runners, if you look very closely indeed, there’ll be a familiar face that you might just recognise – Paula Radcliffe! Radcliffe is a pioneer in the world of distance running! She has broken records; won medals; changed perceptions about what was possible for female distance runners; and it might be worth a mention that in 2003 she set the still-standing women’s world record (which is 2:15:25) in London! Radcliffe owns one of the fiercest competitive spirits the running world has ever seen, but as she prepares to run the London Marathon on April 26, she knows that chances are unlikely she will add a fourth London title to her packed trophy collection. In 2012, as she prepared to run for gold in London, she was forced to withdraw from competitive running, and underwent a bone graft on an 18-year-old stress fracture. The road since has been a long journey of recovery and rebuilding to prepare her for the start line once again. So it’s fair to say that this years race is going to be a particularly emotional one for the runner! 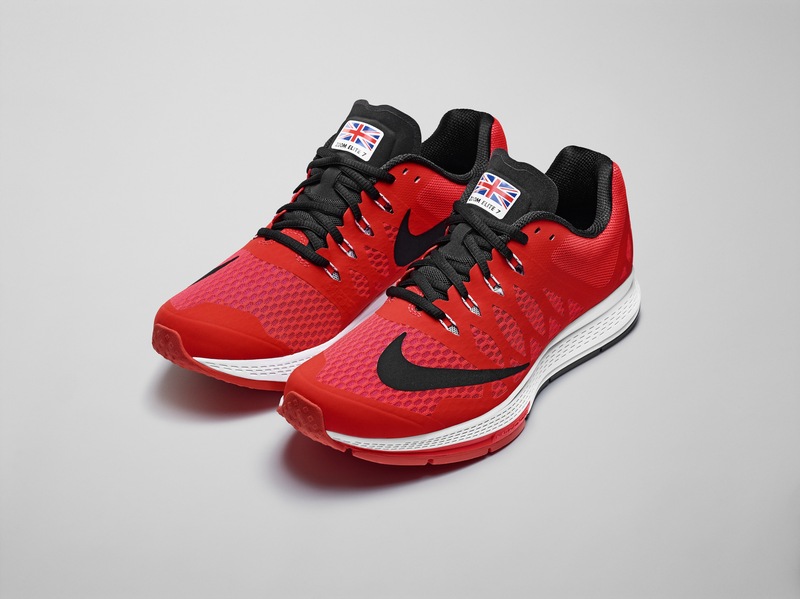 To commemorate the occasion Nike has created a special colour of the Nike Air Zoom Elite 7 trainer that Paula will wear to race (Paula has been a Nike athlete since 2001). In celebration of Radcliffe’s race in London, Nike is also launching a campaign to recognize her impact on runners at every level. The digital-led campaign will invite runners to share how Radcliffe has inspired them using the hashtag #thankspaula.